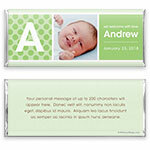 Perfect for a boy or a girl, soft polka dots and a baby block initial bring simple, modern style to this photo candy wrapper design. Design: Block initial with photo and polka dots. Personalization: Front initial, photo and message with back text.